I have, of late, been attending Sunday services at Grace St. Paul’s Episcopal Church in Tucson. What that might say about my views on religion is something I’ll save for a later time, but among the things that have drawn me to involve myself with that place are, first of all, its declared mission of caring, openness, social action and inclusion, and secondly, the deep insights into Biblical and related scriptures of its rector, Rev. Steve Keplinger. In his sermon of November 19, 2017, Rev. Steve Keplinger explains the meaning of the parable of the talents (Matthew 25:14-30). Looking at it in the context of the prevailing culture at the time of Jesus, and the audience he was addressing, Steve’s interpretation will surprise you, as it did me. It makes a great deal more sense than the interpretations I (and probably, you) heard in your earlier religious education. The first part of the audio recording is a clip from the soundtrack of the movie, Jaws, in which two of the characters compare their scars from wounds suffered in previous encounters. That sets the stage for Steve to describe his spiritual scars that remain from his earlier encounters with incorrect interpretations of that parable. You can listen to it here or on the Grace St. Paul’s website, or you can read the transcript here. Here is a well done video by Islamic scholar Tarek El Diwany, in which he outlines the history of usury and interest and explains difference between them. He goes on in parts 2, 3, and 4 to describe the evolution of the present destructive debt-money system and the choice before us. Well worth viewing.–t.h.g. The Fellowship of Reconciliation (FOR) is an international interfaith movement that has been working for peace, justice and nonviolence for almost a century. As a result of meeting Ray Foss during my tour of Oregon and Washington about a year ago, I reconnected with FOR. Ray has lately been instrumental in raising the issues of “usury” and “the money problem” amongst various faith-based communities. I think it is largely through his efforts that a recent issue of Fellowship, the magazine of FOR, had a major focus on Rethinking Money. Starting with a fine editorial by Mark C. Johnson, FOR executive director, that section of the magazine contains articles by both Ray and myself. My article Money, Usury, and the Economics of Peace, can be read online. The arguments against the practice of usury/interest go way beyond scriptural prohibitions. It is now obvious to anyone who cares to see, that there are solid economic and social arguments that should be sufficient to persuade any rational person that our present system of money and finance, based as it is on compound interest (usury), is not only unjust, but also destructive to the natural environment, the social fabric, and the common good. World debt has been growing much faster than any measure of economic output, even GDP (gross domestic product), which includes not only the production of goods, but also the production of “bads.” The financial crises we are seeing in various countries and economic sectors are evidence that the debt burdens have grown far beyond what can be borne by either the private sector or by governments. The growth of debt must stop. A new economic and financial order must soon emerge, if not consciously and deliberately, then it will happen on its own through the descent into chaos. If political and financial leaders cannot accept the end of the old order of things, then the people themselves must take the lead to develop new arrangements that build a peaceful, more equitable society, from the bottom up. How that might be done s the subject of the latter (prescriptive) chapters of my book, The End of Money and the future of Civilization. The present disorder in the financial markets and the cascading failures of financial institutions come as no surprise. Those who recognize the impossibility of perpetual exponential growth and who understand how compound interest is built into the global system of money and banking expect the continuation of periodic “bubbles” and “busts,” each of increasing amplitude until the systems shakes itself apart. Engineers call this phenomenon, “positive feedback.” Such a system cannot find equilibrium. Imagine a heating system in which the thermostat, sensing a rise in temperature, calls for more heat instead of less. Such is the nature of the debt-money system. 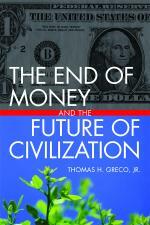 The imposition of interest on the debt by which money is created, demands that more debt be created. Such is the debt imperative which gives rise to a growth imperative. Among other things, it prevents the emergence of a steady state economy. Is this the final round? Who can say? Can the system be saved yet one more time? Maybe. Under the central banking regime which has become all but universal in countries around the world, money has been politicized. The collusion between politicians and international bankers enables governments to extract wealth from the economy by deficit spending and banks to extract wealth by charging interest on money as they create it by making loans. These two parasitic elements take wealth away from productive members of society and lavish it on military adventures, international intrigues, wasteful boondoggles, and financial finaglers. When the system spins out of control what will come out of the chaos? It is impossible to predict but here are two strong possibilities. When the dollar collapses the financial and political elite class will certainly try to orchestrate a new global monetary regime based on the same old mechanisms for centralizing power and concentrating wealth in their own hands, seeking to complete the New (feudal) World Order which has been abuilding for the past three hundred years. Another possibility is the emergence of the kind of decentralized, democratic, and sustainable system we have been advocating for a long time. We had better get ready to seize the opportunity that accompanies this impending crisis. How? By organizing ourselves in our local communities and affinity groups to reclaim the credit commons, to create interest-free, non-dollar, non-bank exchange mechanisms and payment media. This is not as hard as it seems We already know how to do it. All it takes is organization and will. Central banks have one true function, that is to manage the effects of the parasitic drain, to decide who will pay the price, who will feel the pain. They can either (1) restrict credit, thus causing recessions, bankruptcies and unemployment; or (2) they can expand credit and inflate the money supply by monetizing debts (either public or private) that are uncollectible. Given China’s position as one of the United States’ biggest creditors, it is in a powerful position to determine the outcome of the current and future financial crises. If they don’t like the restructuring plan that the financial elite wants to put in place, they can kick over the table by dumping their dollar holdings and causing the value of the dollar to crash through the floor. Organized others acting in cooperation might do the same. My upcoming book, “The End of Money,” due to be published early next year by Chelsea Green, will elaborate these points.